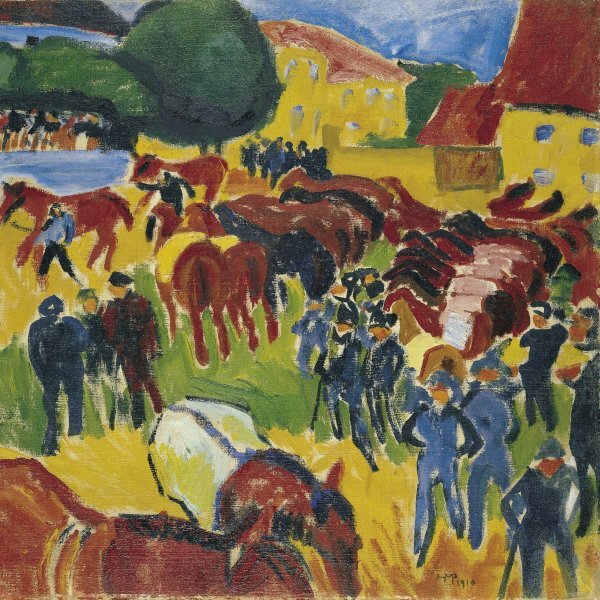 The German Expressionist painter Max Pechstein first trained as a decorator’s apprentice in Zwickau and moved to Dresden in 1900 to study at the Kunstgewerbeschule. In 1906 he met Erich Heckel and through him joined Die Brücke (The Bridge) along with Ernst Ludwig Kirchner and Karl Schmidt- Rottluff. During the following years he shared their revolutionary ideas on art and their interest in primitive art and travelled with them to different parts of Germany to paint outdoors. In 1907 he was awarded a scholarship to travel to Italy and subsequently visited Paris, where he met the Fauve group and persuaded Kees van Dongen to collaborate with Die Brücke. On returning to Germany, he took up residence in Berlin, to which the rest of the members of the group moved three years later. In Berlin Pechstein had the opportunity to secure more commissions, which materialised in the decoration of numerous private residences and in the design of stained-glass windows. During this time his work began to be publicly acclaimed, ahead of the rest of the group. Throughout his life he combined intense public activity — such as the founding of the Neue Sezession after the Berlin Secession rejected some of his paintings and taking part in the Novembergruppe — with temporary retreats to places isolated from civilisation, such as Nidden and Leba in the Baltic Sea and Palau in the South Seas. When the National Socialist party arrived in power in 1933, Pechstein was forced to abandon painting and was dismissed from his teaching post at the Preussische Akademie der Künste, where he had worked since 1922. He was also included by the Nazi regime in the Munich Entartete Kunst (Degenerate Art) exhibition and his work was removed from the state museums. After the Second World War ended, Pechstein was reinstated to his post and received many recognitions for his work. He died in West Berlin in 1955.